Join us for this year’s event 5th – 7th July. More recruitment of new members for the expanding Rotary Satellite Club of Chesterfield, which continues to attract busy younger professionals in the town wanting to do their bit for the local community. The latest to be inducted into the worldwide Rotary movement, by Chesterfield Rotary president Barry Thompson, are IT company director, Andrew Thompson, and insurance advisor, Phil Coates, and he was assisted by Satellite Club chairman Peter Blant. 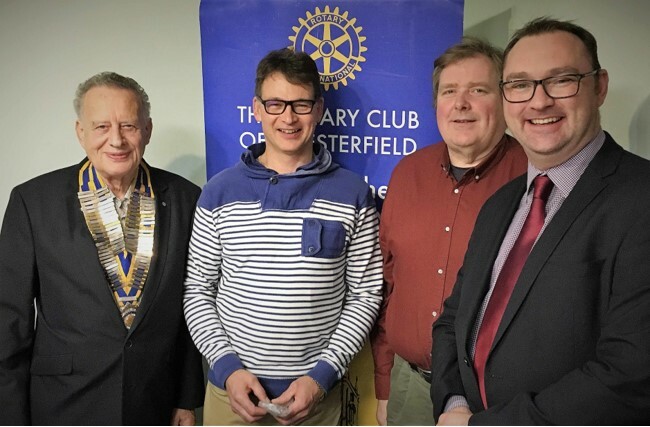 From left to right, Chesterfield Rotary president Barry Thompson, IT company director Andrew Thompson (no relation), insurance adviser Phil Coates, and Chesterfield Rotary Satellite Club chairman, Peter Blant. The Rotary Club of Chesterfield is delighted to support the ‘Three Bedded Bays Project’ at Ashgate Hospicecare, a £750k major upgrade of the in-patient bays to provide a more flexible, cost effective, pleasant environment. This donation of £2,750 is from part of the proceeds of Chesterfield Rotary’s 2018 Eckington Classic Car & Bike Show held at Renishaw Hall. 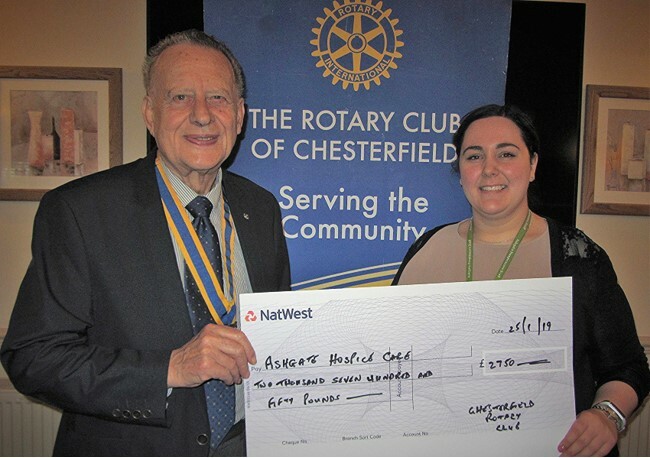 In the pic left to right, Chesterfield Rotary president Barry Thompson presents a cheque to Sarah Green, community fundraiser for Ashgate Hospicecare. 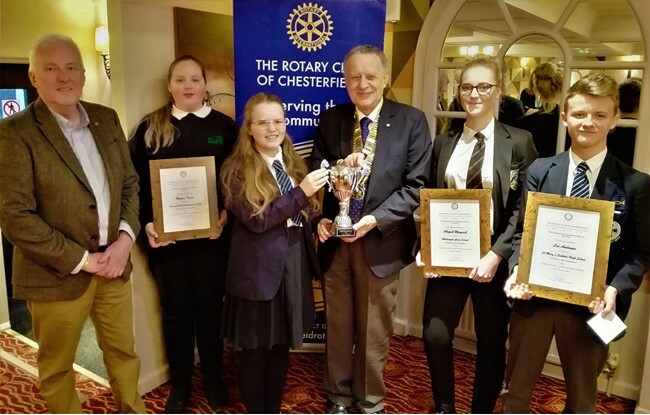 The final of the Chesterfield Public Speaking Competition for local secondary schools was held on Friday 18 January 2019 and organised by Chesterfield Rotary for the 53rd consecutive year. The winner, in a high-quality competition, was Iona Blair from St Mary’s Catholic High School, with her political talk on ‘What’s the point of public demonstrations’. Runners-up were, Megan Trevis from Hasland Hall Community School, Abigail Maycook from Whittington Green School, and Leo Andrews also from St Marys. Organiser was rotarian Paul Davies, secretary of the Rotary Satellite Club of Chesterfield, who congratulated all the finalists on their excellent talks. 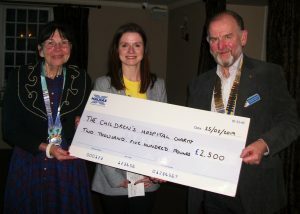 From left to right: Rotarian Paul Davies (organiser), Megan Trevis (Hasland Hall), Iona Blair (St Marys), President Barry Thompson, Abigail Maycock (Whittington Green), and Leo Andrews (St Marys). WIN A DEFIBRILLATOR FOR YOUR COMMUNITY !! Please let DG Cheryle know by Feb 14th how many of your Club Members have done the Free Online Life Saving Skills Course. The Club with the highest Percentage of Club Members completed will win a Defibrillator for their Community. The Course is Free and only takes about 40 Mins to complete. You can even do it in Stages of 10 Mins. Just go onto the following Website www.virtual-college.co.uk/prepared. Together we can “Be the Inspiration” to Save Lives. Tell you Families, Friends, Schools and Community Groups and encourage them to do the Course. Thank you all so much for helping to make our District Conference such an enjoyable and inspirational Time together. Martyn Bye and the whole of the Conference Team worked tirelessly and enthusiastically to provide Inspirational Speakers, an Informative Showcase and Vibrant Entertainment. I really appreciate the great effort you had all made to be there. Our Theme was “The Family of Rotary ” where we work together to make a better World. I do hope that you have returned to your Clubs ,having enjoyed Fun and Fellowship together , with a renewed enthusiasm to help our Local and International Communities. 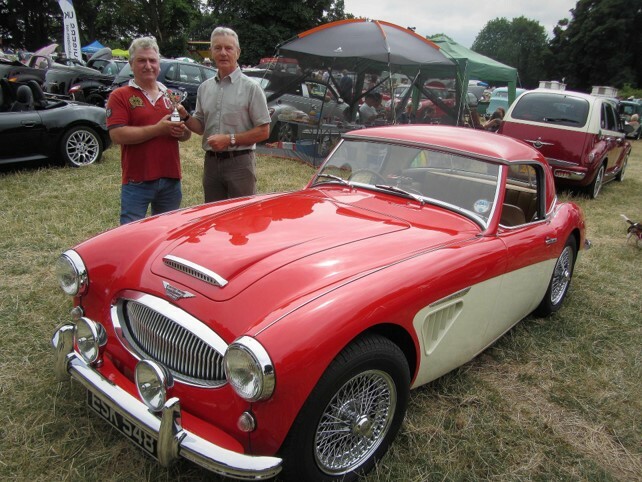 Thousands of pounds has been raised for local charities after the crowds really turned out in the summer sunshine for the area’s biggest Classic Car & Bike Show held at Rectory Fields, Ashover on Sunday 22 July 2018. 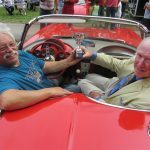 With hundreds of cars and bikes from all eras on show, the event organised jointly by the Rotary Clubs of Chesterfield, Chesterfield Scarsdale, Clay Cross, and Matlock, is being considered to be ‘best yet’. 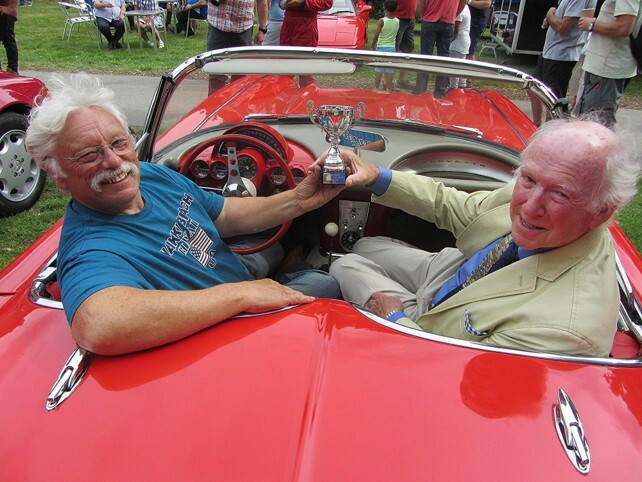 Winner of ‘Best Car’ was John Gregory of Kilburn, near Derby, for his 1962 Austin Healey 3000. Trophy presented by Chesterfield Scarsdale Rotary president Ron Enock. 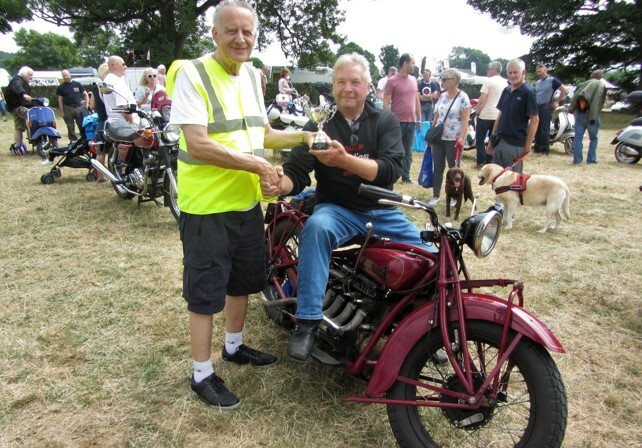 Winner of ‘Best Bike’ was Jess Bamford of Codnor with his very rare 1929 Indian 4 1260cc American motor bike. Trophy presented by Chesterfield Rotary president Barry Thompson. 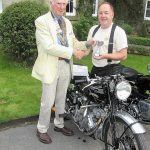 Hundreds of enthusiasts from across the region turned out for this year’s Eckington Classic Car & Bike Show held in perfect weather at Renishaw Hall on Wednesday 13 June 2018. The event is expected to have raised a few more thousands which will be shared by four key local charities – Ashgate Hospicecare, Bluebell Wood Children’s Hospice, Sheffield Children’s Hospital, and Weston Park Cancer Charity. 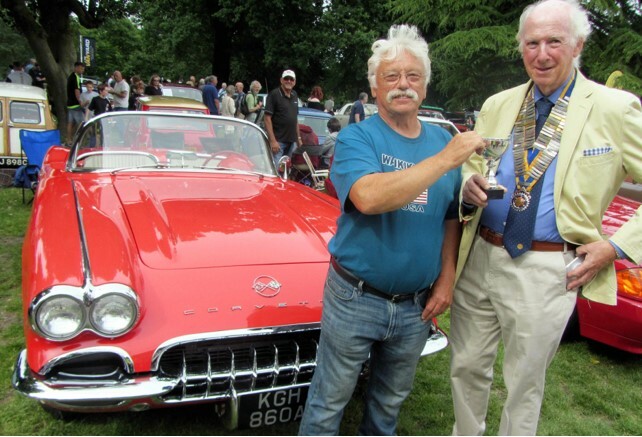 Winner of best car was Stephen Ashton from Ecclesfield, with his 1962 C1 Corvette V8. 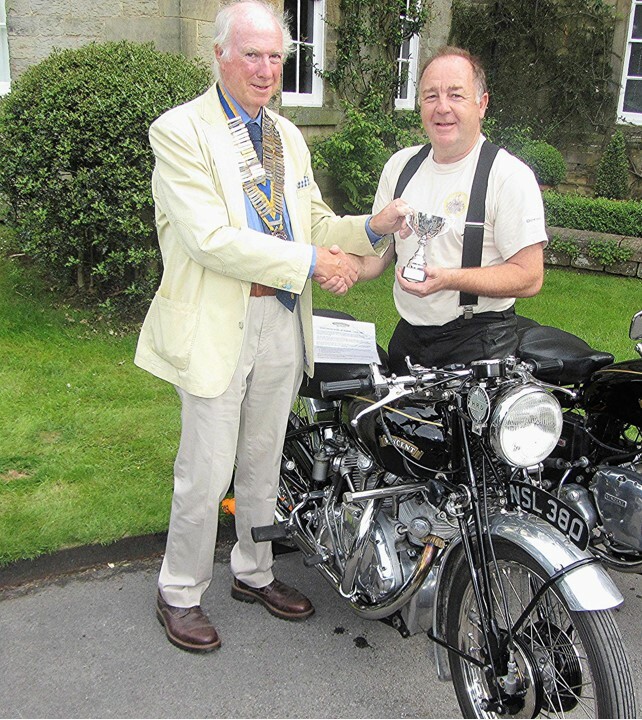 Also, congratulations to Jon Lambley from Alfreton, winner of best bike at the show with his 1949 Vincent Series ‘B’ 1000cc Rapide. The winners were presented with their awards by Chesterfield Rotary president Peter Barr. 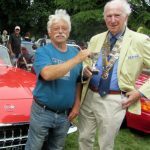 Next motoring event is the Ashover Classic Car & Bike Show being organised jointly by the Rotary Clubs of Chesterfield, Chesterfield Scarsdale, Clay Cross, and Matlock at Rectory Fields, Ashover, on Sunday 22 July 2018 (10.00am to 4.00pm).